We are proud to have exceeded the expectations of over 500 clients who are leaders in their stream of the industry. This includes not only major India but also multinationals as well. 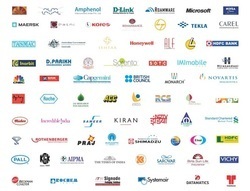 And some foreign companies of our clients in all our business endeavors till date. Regular interaction with the client is done on a regular basis to gauge their needs and offer the services accordingly. We have designed world-class modular display systems and custom fabricated exhibition booths that have helped our clients in showcasing their products and services to their customers.